I have always been short sighted and 3 years ago had cataract operations in both eyes. I was so happy that for the first time in nearly 60 years I could see distances without my glasses, albeit needing them for reading. However, at a routine exam at the opticians I was referred to the emergency appointments dept and was told I had wet AMD in my right and dry AMD in my left eye. 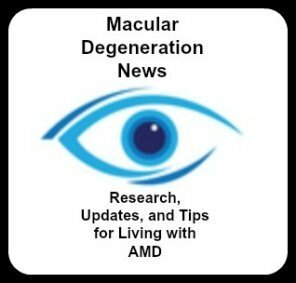 I could deal with the dry AMD as my sight is still comparatively good, but the news of my wet AMD broke my heart. I went home and cried for two days. My mother had AMD and was completely blind at the end of her life, she did live to be 89. It has always been a worry at the back of my mind but I hoped that I would at least have a few more years of good sight as I am still only 62. 5 days after being diagosed I had an angiography of the back of my eyes (that in itself was painless and nothing to worry about) and given my first course of photo dynamic therapy (PDT). I was also offered the option of Lucentis injections but the consultant frightened me about this as he said someone as short sighted as me had a higher chance of retina detachment and total blindness through this treatment. However I still have the option of this treatment open to me and just don't know what to do for the best. On the positive side I keep telling myself how lucky I am compared to my mother. There was no cure for her. At least now we have some chances of treatment and more research is being done all the time, so I have stopped feeling so sorry for myself. I am now concentrating on researching all I can about this disease and all the help available. Has anyone else any experience of any of the treatments I have mentioned here. I am 71 years old, male and live in Christchurch, New Zealand, where we have experienced around 8000 earthquakes and after shock events over the last 14 months. I have always had good vision in both eyes, up until just a few months ago, although I have worn reading glasses for a few years. On 23 August 2011 I went to my optometrist for an assessment to upgrade my reading glasses. This had been prompted by the fact that for the previous two or three weeks I had noticed a fuzziness around the centre of my left eye which I had thought was more moisture in the eye due to the possibility of a cold coming on. As a little background information, I have been involved in the sport of Indoor target shooting for many years, (with some success, and in fact in early August had won my grade in the local championship finals. As part of my involvement I was doing some coaching for other shooters. Some of this involved looking through a small 'spotting telescope' at the distant targets, and because I did not want to put excess strain on my 'aiming' right eye, I used my left eye to look through the 'scope'. I had never had any problems in the past, but it was doing this type of activity over the previous few weeks that I suddenly noticed the fault in my left eye vision. At my check up on the 23 August I was advised that there was this problem in my left eye, and an urgent appointment was made for that day with an Ophthalmologist. This was when I was made aware that I had developed the wet macular degeneration problem, and various options were explained to me. I subsequently went through the procedure of having an intravitreal injection of Avastin into the left eye on 02 September 2011. I was advised that this procedure could not be guaranteed for success, and that it might also be necessary to undergo more than one after about 6-8 weeks periods. So far this first treatment has proved successful, and at the recent follow up consultation the 'eye-doctor', (easier to spell) was extremely pleased with the result. I am aware of ongoing requirements for diet and exercising to keep blood pressure under control. I am also aware of the availability of many visual aids which I hope I may never have to use, through an earlier contact with an older woman friend who had been suffering this problem from many years development. My story is put here to encourage anyone who is unlucky enough to develop this problem to seek EARLY advice and treatment. Thank you Brian for sharing your story. My nephew is planning to go to New Zealand in February. He has been there before and says it is one of the most beautiful countries. Best wishes for good vision for a long time! A year ago in May I was diagnosed with wet macular degeneration in my right eye. Symptoms were mainly an area above my central vision that was distorted, like looking through a coke bottle. I had a series of three Lucentis injections which actually helped. Then about a month ago I noticed the same defect was back, within a week or so it changed and became a round white-out area in the middle of my central vision. I went back to the retina doctor and got an Avastin injection with more scheduled every four weeks. Vision tested was 20/400 in right eye. I have so many questions and no one to answer them. Is the Avastin going to restore my vision? I do medical transcription for a living. So far I have been able to continue working, wondering when the other eye will become affected. A friend told me I should apply for disability but I just can't see myself doing that. I've stopped driving except to the grocery store and never at night, way too light sensitive. I'm wondering about others experiences with dealing with all this. Thanks. This is the Reader's Digest version. In June of 2005, I had "the" problem in my left eye. The ophthamologist that I saw said it looked like a welder burn, though I hadn't done much welding. I didn't have it checked as he'd suggested. As it got worse, my brain tuned it out and it ignored it. About 3 years later, the right eye was affected. By that time, the left was badly scarred and untreatable. Three different doctors said the same thing: get it treated, or lose central vision. After 2 years of injections, a study program presented itself using pazopanib or Votrient as it's called and Avastin. The theory here was using a "double down" effect to stave off the effects of AMD. It was a real God send and has helped to stave off the disease to this point. The study program is thirteen months and it's now in its fourth month. This is a phase III study, by the way. It can't be stressed enough for people with this condition to follow the progress on the study of pazopanib. I fully expect it to be approved, but only considering my own condition. If the results are as good as I think they may be, it could eliminate the use of injections. The results in my case have been very good. The leakage is down and fluid levels have abated quite drastically in just a few months. Don't give up hope!